Many years ago I competed in the Naumburg Competition in New York City and, although I practiced hours and hours a day on repertoire such as the Nielsen “Clarinet Concerto” and the Martino “Set for Clarinet” (some of the hardest pieces in the clarinet repertoire), I didn’t advance past the preliminary round. Happily, my most recent experience at a high profile competition had a different outcome. I present this information here partly as a chance for me to relive the joy and excitement of the event but mostly to share information which could be helpful to any musician – at any level and in any genre – planning on participating in a competition. A summary of tips at conclusion of article. The International Jewish Music Festival and Competition is held every other year in Amsterdam and draws musicians from around the globe. The application process began 8 months prior to the start of the festival with a Facebook notice announcing the event. The application required detailed biographical information, audio and video examples, a list of repertoire of our own choosing for each of the rounds, a mandatory piece that each performer or ensemble would be required to play, and an application fee. Out of over 100 applicants my Jewish music ensemble, Big Galut(e), was one of 24 chosen to participate and the only one from the United States. The months between notification of acceptance and actually arriving in Amsterdam was filled with preparations including raising funds through grant writing to cover some of the costs, researching lodging for five people – would it be cheaper to get an Airbnb where all of us could stay or take advantage of a discounted hotel offered by the Festival? Should we be close to the Festival site or deal with trams and buses with our instruments? -purchasing airline tickets, making sure passports were in order, researching restrictions on certain instruments (more on this later) and, of course, practicing. I also scheduled several concerts in the United States as practice performances utilizing our competition repertoire. I chose to arrive in Amsterdam several days before the start of the event (and a day before my fellow bandmates) so that I would be over jet lag by the time we would begin rehearsing. Once all of our members convened in the city of Amsterdam, we set up a rehearsal schedule, attended the opening reception of the Festival, met some other musicians and got the lay of the land. There were two days allotted for the first round and we were scheduled for the second of those. That gave us a chance to meet and hear some of the other groups, get a sense of the acoustics in the beautiful and historic Uilenberger Synagogue, and acclimate ourselves to what we might expect. This turned out to be incredibly beneficial – we actually revised some aspects of our presentation as a result. For our presentation the following day we decided to demonstrate the wide variety of styles we incorporate in our repertoire; we performed two original klezmer tunes that I wrote (including one with quarter-tones which the jury thought was quite funny), a Baroque sonata by the 17th century Jewish composer Salamone Rossi, a humorous take (by singing it in French) on the Yiddish classic “My Yiddishe Momma” , among others. We had to carefully make cuts in several of our selections so that we would not go over our allotment of 20 minutes; these cuts were deliberately chosen so as not to unduly disrupt the musical flow of each piece. Having an audience to play for was a wonderful bonus – it felt just like a regular performance for us (with a peripheral sense of being formally adjudicated) and I have to say we had a great time. We played well, we communicated musically with each other, and just enjoyed the chance to make music. It’s important to note that, for me at least, I went into this with as little attachment to winning as I could muster. I tried to see it as a rewarding opportunity in and of itself and that anything after that would be icing on the cake. When we were told that out of the 24 ensembles we were one of 8 to continue on to the semi-final round it was wonderfully exciting – and validating – but I hope I would’ve felt good about the whole event had that not happened. In any case, yes, we went on to the next round and again chose our repertoire carefully – this time trying to demonstrate aspects of our style and rep that hadn’t been demonstrated in the first round. In retrospect, I think we all feel we misjudged our choices. We wound up coming across as a little too serious (whereas in the first round we had the audience and judges laughing and smiling throughout) and partly as a result of that we were not selected to be one of the four finalists despite the fact that we felt we played our very best. However, there were numerous prizes awarded that were separate from the grand prize and we were fortunate enough to win one of them – it was called the Simcha Prize (simcha is a Hebrew word for joyous event) and the organizers are quoted as saying when they were presenting it to us: “very gifted musicians with high quality playing … and very entertaining”. The prize came with a cash award of $500 Euros. 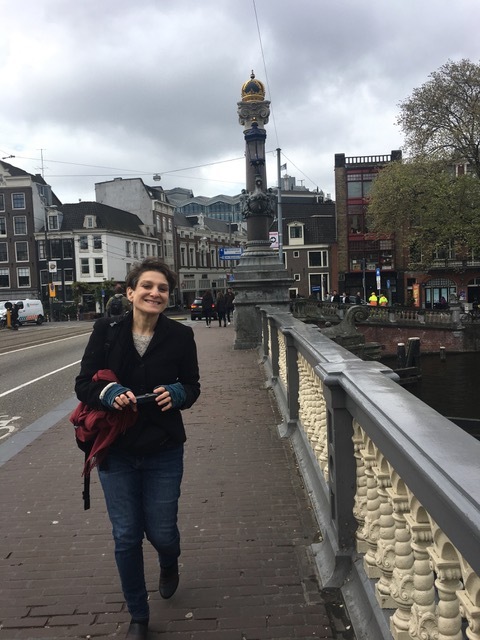 Not having to play the final round was a blessing in disguise as we were suddenly released from all pressure while having a totally free day in the enchanting city of Amsterdam. We now suddenly had time to explore, sight-see, etc. and being able to do those activities (Van Gough Museum, Rembrandt House, lunch and dinner in fantastic restaurants) together as a group strengthened our already great sense of friendship with one another. Plus, we had the joy of knowing we had played our best and had been recognized for it. At that point we realized that we had accomplished everything we had set out to do and, even though we did not “win”, we won. Read all the applications materials carefully to make sure you meet the requirements such as age limit, instrument, etc. Make sure you will be able to play the required works well enough to be competitive. Submit ALL application materials (such as audio/video samples, fees, etc) on time. Make hotel and airline reservations carefully. If overseas make sure your passport is valid for more than 6 months before expiration. You can be denied entry to a country if it is not. Be sure to know ahead of time if your instrument is made with restricted materials such as ivory — many string instrument bows contain ivory and, in fact, our bass player had to take a carbon fibre bow to Amsterdam. Grenadilla wood (the preferred material of professional level clarinets) is also now restricted but only if your instrument weighs more than 10 pounds. So, traveling internationally with standard clarinets is not a problem. Straddle the paradox of committing yourself to winning but not being attached to the outcome. In other words, do everything you can to achieve your goals (including visualizations, affirmations, etc – see earlier blogs of mine regarding this issue) but don’t let the attachment to winning keep you from doing your best; the attachment can keep you feeling anxious and fearful, can block inspiration, and can keep you from learning and growing from the experience. And finally, Go For It! Watch our short video for a sample look at our recent IJMF competition. Big Galut(e) is the first ensemble featured. As an added bonus, the organizers chose our recorded music as the background audio for the little montage. You may have to login to Facebook to view the video.